We are honored by the opportunity to walk alongside you in this marriage ministry, from Yes to I Do and beyond, and we love returning to our couples' stories as they continue to unfold. If we've featured your love story in our How He Asked engagement series and you now feel called to share your wedding with us, as well, submission details can be found here. Read more here for the story of Danielle and Jeff’s engagement, a tale of patiently growing attraction after Jeff discerned out of the seminary during their time in grad school. Shortly after celebrating their first anniversary as husband and wife, newlywed Danielle reflects back on her wedding day with her husband, Jeff. She says, “The memory of that special day is never far from my mind. I still recall something that our priest said during the homily at our nuptial Mass, which was, "Take this early time, this time in which despite whatever fears and anxieties you have, most everything that you dream of seems possible. And cherish that time." For Danielle, the whole day felt like a fairy tale come true. From the Bride: It was finally here! Friday, August 4th 2017. The day I had prayed and waited for my whole life, and it was such a beautiful day, with sun rays beaming brightly through the windows. The bridesmaids and I got ready in the basement of St. John the Baptist Catholic Church, in Vermillion, Minnesota. The girls donned floor-length dresses in a rose-violet shade. My wedding dress was a pure white ballgown with a layered tulle skirt. It had a sweetheart neckline, overlaid with lace, and was cinched at the waist with a crystal belt. I had help fastening my cathedral-length veil and jeweled comb in my hair. The bridesmaids put on their veils and said a silent prayer over me. Since Jeff and I were having a Solemn High Nuptial Mass, it was fitting for the ladies to also wear a veil, according to the reverence and tradition that we wanted to uphold. The Extraordinary Form had become something special for Jeff and I throughout our relationship, and it was exceptionally meaningful for us to have it for our nuptial liturgy. Throughout the morning, my soon-to-be-husband and I made sure we didn’t see each other before the wedding. 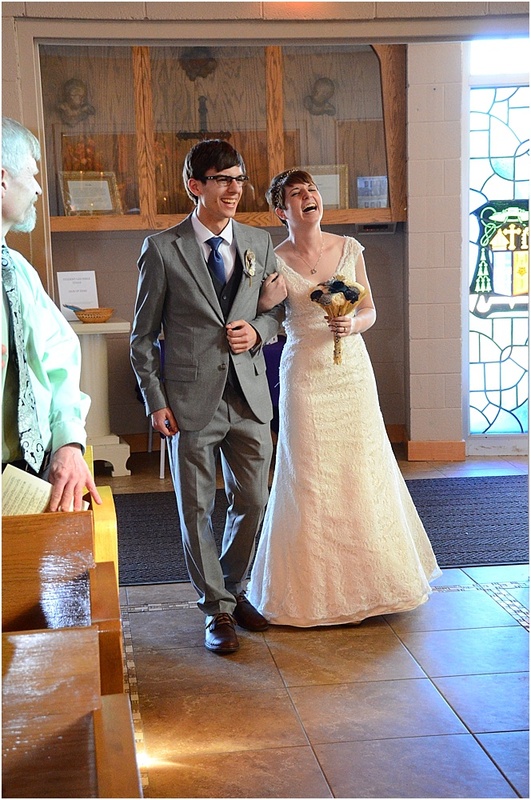 We wanted to save that moment for the time I approached him walking down the aisle. At 3 PM the choir chanted Atténde Dómine (Hear Us, O Lord) for the procession of the clergy, and the organist played Canon in D for the entrance of the wedding party. Just before my turn to walk down the aisle, the ushers closed the giant double doors that led into the church. When the doors swung open again, I saw everyone. The church was incredibly grand and beautiful to behold. I stood there with my blusher draped over my face, holding onto my bouquet of white roses with Grandma Rother’s rosary wrapped around it. This rosary was special because Jeff’s grandmother received it from her husband. She walked down the aisle with it on her wedding day, just like I was about to do. My dad and I started walking down the nave of the church, and I saw Jeff standing at the end of the aisle. As we got closer, his smile turned into tears of joy. When we approached the end of the aisle, my dad lifted the veil from my face. I took Jeff’s hand, and we ascended the stairs into the sanctuary to take our vows. In the tradition of the Latin Mass, the vows are said at the very beginning of the ceremony. It was very special to be in the sanctuary. 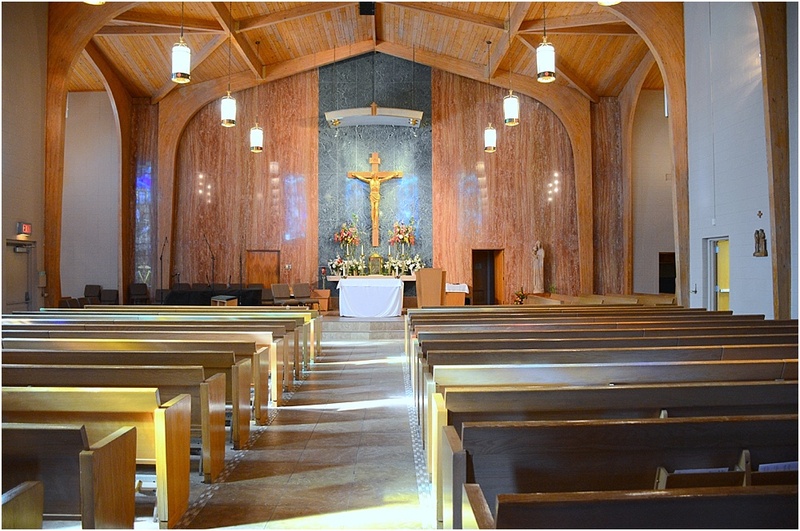 Traditionally the sanctuary is reserved for the clergy, but during the sacrament of holy matrimony the bride and groom are permitted to enter beyond the altar rail. In that moment I felt so close to God. Once we exchanged consent, Jeff and I joined our right hands, and he made his vow to me. We were asked to release our hands and then join them together again. Then I made my vow to him. This act of joining, releasing, and joining hands again signified that our vows were made individually. We each had our own responsibility to the other. At the completion of the sacrament, Fr. Byron Hagan, our celebrant, prayed over us and sprinkled us with holy water. The ceremony continued with the Mass after the Rite of Marriage, and it was absolutely breathtaking. After the Gospel reading, Fr. Hagan gave an excellent homily and made powerful points about how society has made our generation fearful of marriage; that people today are not rising to the occasion to live out God’s calling in the sacrament of holy matrimony. They fear it is too much of a weight to bear. “I want to tell you something today,” Fr. Hagan said. While he acknowledged that the married state would bring challenges for us, he reminded us we must always remember the Divine Third in our marital union: God Himself. The Mass continued with chanting and incensing of the altar. 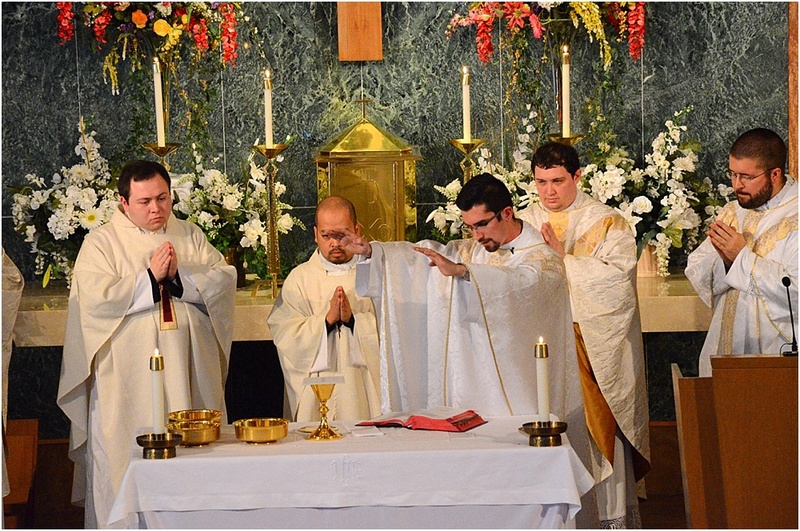 During the consecration the priest faced the altar and said the words of consecration silently over the host and chalice. It was completely silent now in the church except for the bells that were rung three times during the elevation of each of the sacred species. In keeping with the tradition of the Latin Mass, the altar rail was used for the distribution of Holy Communion. The communion hymn we choose was Adóro Te Devóte (I Adore You Devoutly), written by St. Thomas Aquinas and used as his private prayer during Eucharistic adoration. After Mass, we got in the car and drove to the reception venue, a golf club. The day before, our family had gone to the venue and decorated the tables with mirror and bud vase centerpieces. All of our guests had a stick of bubbles by their place setting, which was a fun and interactive way for them to participate in the grand march and the rest of the evening. 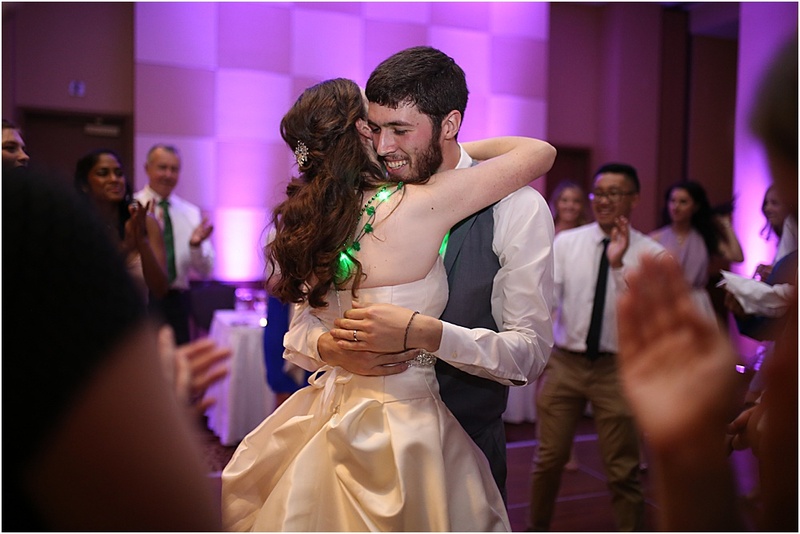 The final moment of the night was our first dance. During our engagement, Jeff and I had practiced for hours to master the waltz. And even though we had done it many times before, I was nervous having all eyes on us. Jeff and I looked at each other intensely, counting the beats of the music in our heads. All of a sudden, the music intensified, and we were off. It was like I was floating on air, even though I was just trying to stay balanced in my high heels. I had never danced in my wedding dress before either, so it was quite a new experience. But it was magical. It twirled around me gracefully across the dance floor, and I truly felt like a princess. After dancing for a few seconds, I realized we were actually doing it. All of those hours of practice had paid off. We were dancing a beautiful waltz, and everyone applauded. It only increased their desire to get out on the dance floor later that night. Although there were a few things that could’ve gone better, the vast majority of our wedding was a fairytale-come-to-life. It was a dream come true! To all single women out there, waiting for their prince charming, please remember that this story is a testimony of years and years of prayers finally answered. God hears your prayers and knows the desires of your heart. He will answer them in his, time in a better way than you could ever possibly imagine. In our first year of marriage, we developed a special devotion to Blessed Emperor Karl of Austria and his holy wife, Servant of God, Empress Zita. We look to them for their intercession in our marriage and for all married couples. A quote we both appreciate from Blessed Karl was when he told Zita on the day after their wedding, "Now, we must help each other to get to Heaven." I am very blessed and thankful to have found a husband who also desires to lead me closer to Christ each and every day. Blessed Emperor Karl and Empress Zita, ora pro nobis! 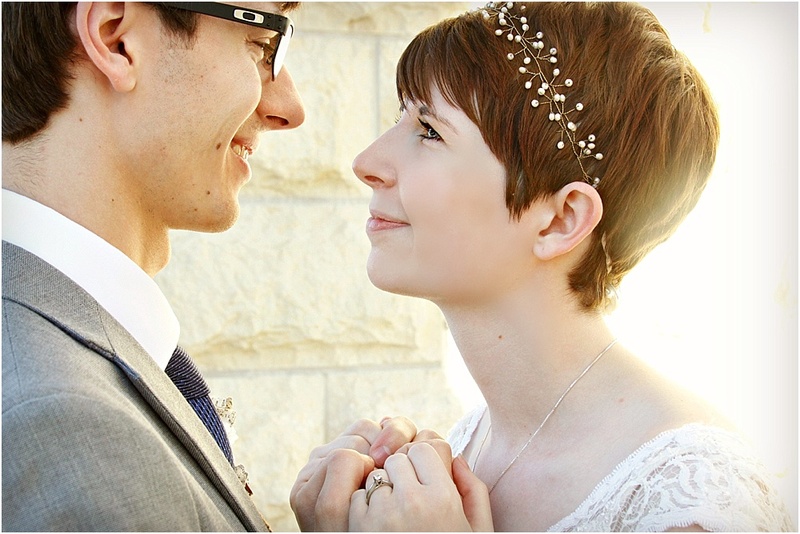 Megan and Josh met at a Catholic grade school in Houston where both of them were teachers and coaches. They initially met in the environment of other coworkers and friends, and over time they grew to mutually respect and appreciate each other’s morals and values. It became increasingly evident that they complemented each other well. Upon realizing that in each other, there was no turning back. It was love at first realization. 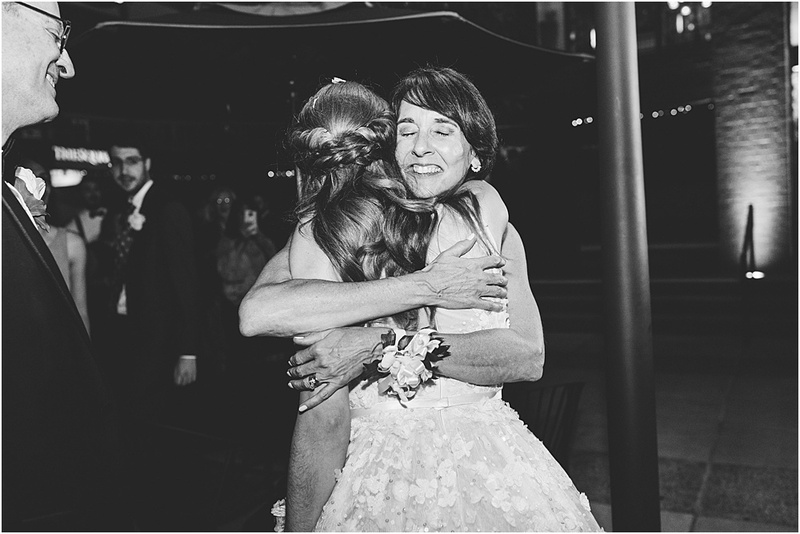 From the Bride: On our wedding day we had all of our loved ones, role models, and loyal friends by our side. All of my family either flew in or drove the long sixteen hours to Houston to celebrate with us. We even flew in my grade school parish priest from Cleveland, Ohio. He was a role model to me and had been an integral part of my formation as a teen. During the wedding planning process, the Mass was all we cared about. Our primary desire was to minister the sacrament of matrimony to each other, so that is where our focus remained. Every reading, every song, every participant mattered more to us than the cake, flowers, food, and dancing combined. For example, the Ave Maria was a must for our us. My uncle sang it beautifully while we honored Mary during the Mass and asked for her intercession. Josh and I were also Extraordinary Ministers of Holy Communion that day. 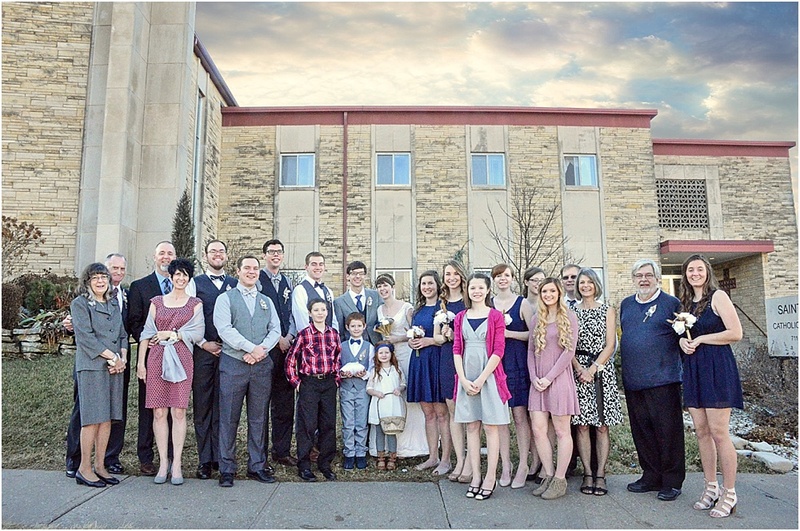 Despite planning this detail far in advance, ministering still brought us both to tears: how could we be any more blessed than to give the precious blood of Jesus Christ to our closest family and friends on our wedding day? I can't think of a more beautiful moment. The Mass was a sheer foretaste of Heaven. Josh and I know we are called to bring as many people as we can to Heaven. 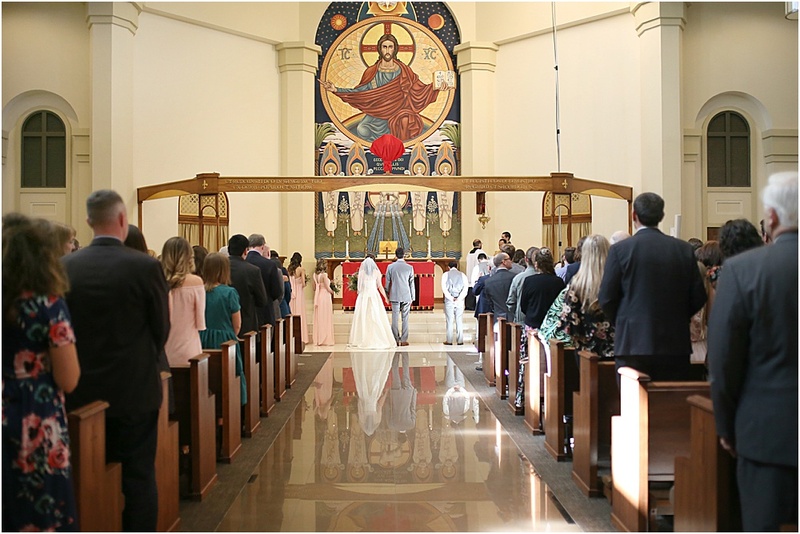 Through matrimony and all of the sacraments, we experience Jesus Christ in both a spiritual and tangible way, and we longed to share this with our guests. We hoped that bringing as many people as we could to celebrate our marriage would inspire them to become disciples of Jesus Christ, just like my husband and I continue to inspire each other. Liz and Grant were good friends in high school but went their separate ways. It wasn’ until their sophomore year of college, at different universities, that they reconnected, and with the potential for more. After a year of renewing their friendship, it became clear to both of them that they desired more. They began attending a weekly Bible study together with Father Sam, the priest who’d eventually celebrate their marriage, solidifying their individual faith lives and pursuit of each other. College meant several years of long-distance dating--including a full school year abroad--followed by Liz and Grant both returning to their hometown and beginning their respective careers. At the San Carlos Cathedral in Monterey, California, Grant proposed. From the Bride: The day Grant asked me to be his bride, the Bishop happened to be at the cathedral for the evening Mass, which we attended right after the proposal. We were honored that he blessed our engagement after Mass, right in front of the beautiful cathedral. We spent our engagement prepping for not only our wedding--which was so fun!--but our marriage, which was and continues to be refining in the best ways. After a 13-month engagement, we were married on July 1, 2017. What a blessing it is to have fostered a solid friendship before growing in our faith together as a couple, and eventually getting married. You never know God's plan, and this rings true for us, as he was writing our story long before we even knew it! At the risk of sounding cliché, our wedding day could not have been more beautiful. We had two primary goals for the day: first, to have a beautiful, sacred, holy Mass. 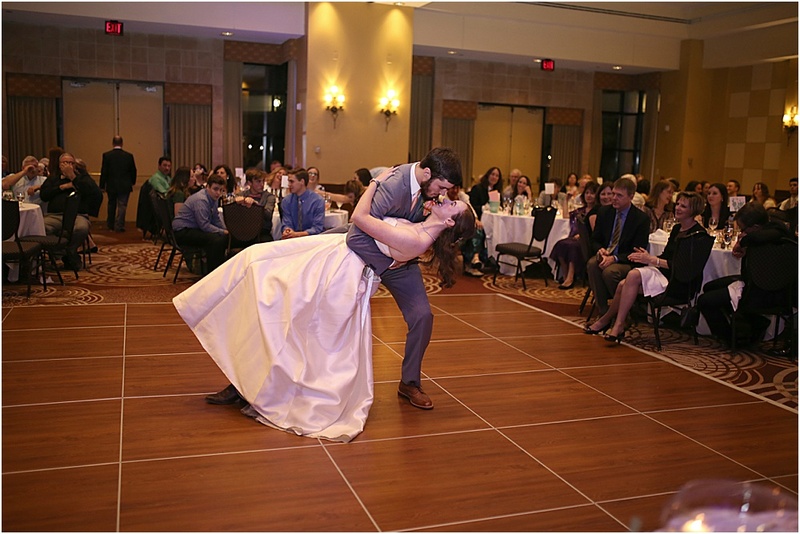 And second, to host a joyful reception with our favorite people in the world, including a packed dance floor. We always talked about getting married out of town--somewhere along the California coast or a quaint town in the wine country. When it came down to it, however, the most important thing to us was not to be in a beautiful city requiring our guests to travel. Being from the same place, we decided that our hometown was the best location for our wedding day. It was convenient for everyone and so special to get ready in my childhood home, while Grant spent the morning of the wedding in the home where we now live. Summer days in California’s Central Valley can be well over 100 degrees, but our wedding day came after a big heat wave and was a perfect low-90s day with blue skies and a light breeze. I wanted my sweet bridesmaids to all wear the same dress, but also wanted to somehow match my Maid of Honor and sister--we constantly match unintentionally! So, we wore the same pair of earrings, which I loved. I also gave matching bracelets to my bridesmaids, my sister, and my. It’s fun to see my favorite women wearing that jewelry now, after the wedding. After going to different bridal salons to try on the same dress three times (I’m a little indecisive…thanks for your patience, mom!) I finally decided to go for it. 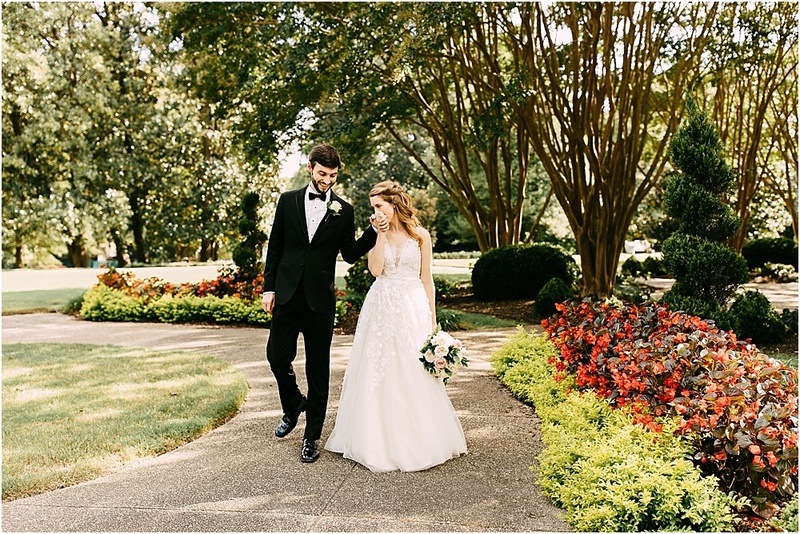 My dress was totally different than what I originally envisioned myself wearing, but I loved its classic silhouette and open back detail. It felt simple, yet distinctive. Also, it had pockets--not only super fun, but convenient! Above all, my gown felt timeless. Past brides had advised me to choose a new perfume for my wedding day, because the scent would always remind me of the day. I highly recommend doing this; now, a year after our wedding, I love wearing my perfume and it always takes me back to July 1. 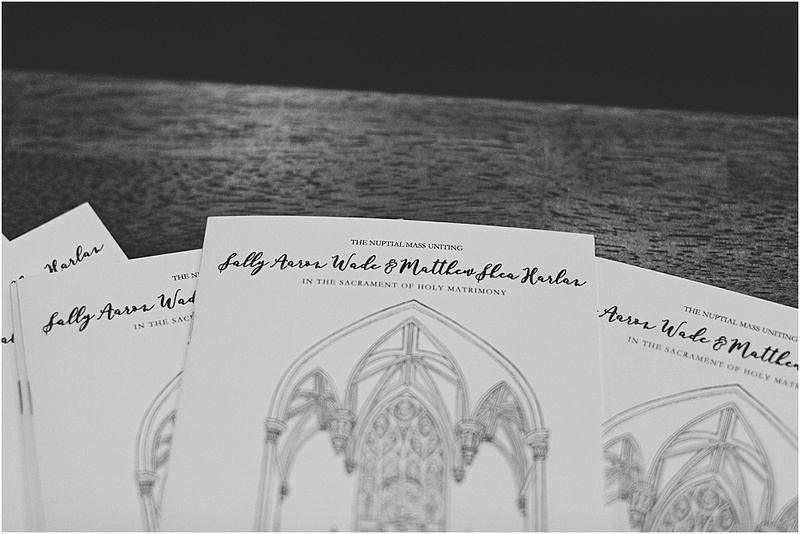 I worked on the invitations with a co-worker who designed a beautiful suite for us, which we printed at a local shop. One of my bridesmaids and college roommates, Erika, calligraphed all of our envelopes and signage for the seating chart, ceremony welcome, aisle markers, and a Saint John Chrysostom quote. Lauren Santos, the artist behind When Beauty Met Truth—whom I met while studying abroad together in London—drew a beautiful crest we used on our stationery and details. The crest inspired the aesthetic for the entire day. My favorite element is the dove, symbolizing the Holy Spirit. We wanted our Mass to exude the beauty of the Catholic Church and of sacramental marriage, yet be engaging for non-Catholic friends and family members. Father Sam did a wonderful job upholding the sacredness of the Mass, while explaining things along the way for those not familiar. For the Mass readings, we chose Tobit 8:4-8,Romans 12: 1-2, 9-18, and Matthew 5:13-16. We chose these readings in order to share their messages with our family and friends, and also because they serve as reminders for ways we strive to live our own lives. Particularly the salt of the earth and light of the world message in the Gospel reading—we believe living a holy marriage allows us to be a light to others in this world. Family and friends did the readings and Prayers of the Faithful, and our parents brought up the gifts. One of my favorite parts of the Mass was signing "How He Loves" during communion with my brand new husband, knowing all of our supportive and loving family and friends were receiving the Eucharist alongside us. It was a really special moment I'll remember forever. We were elated that our family and friends--Catholic and non-Catholic alike--commented on the joy and beauty of the Mass. 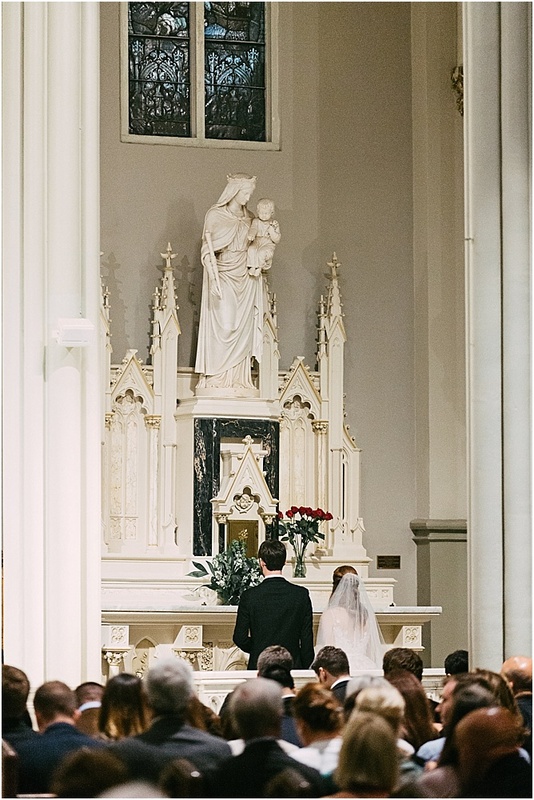 All too often we hear of people saying that Mass is boring or confusing, and we truly wanted our nuptial Mass to be a beautiful expression of our faith and marriage. At the reception, we set a table with family member's wedding photos and a framed quote from Saint John Chrysostom: "The love of a husband and wife is the force the welds society together.” It was a fun way to honor our parents, grandparents, aunts, and uncles as well as the beauty of marriage and the impact it can have on so many. We enjoyed a delicious meal incorporating some of our favorite foods: local peaches—my favorite fruit—in the green salad, and gnocchi—Grant’s favorite pasta—as a second course. After the most heartfelt toasts from my Maid of Honor, Grant’s Best Man, and my dad, and following a surprise disco style father-daughter dance and a Mambo-Italiano mother-son dance, we spent the rest of the night on the dance floor with our favorite people! We opted for a traditional tiered wedding cake—funfetti with raspberry filling—and my mom sewed the tablecloth for our cake table. 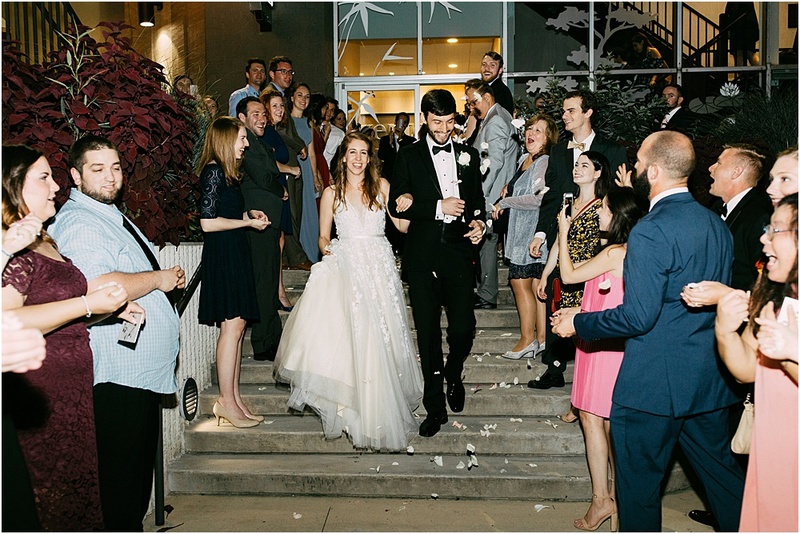 We decided to do a sparkler exit; what better way to close out the most joyful day ever? After Grant and I buckled up in the car and started to pull away, I unexpectedly burst into joyful tears. We both felt overwhelmed with love and gratitude for our day. Praise God from whom all blessings flow! A faith-filled and joyful marriage can have a positive impact on so many people in our broken world, especially those whom we might not ever know we touched. Slowly, patiently, the Lord was preparing them for each other. Jackie found herself beginning to look at David with renewed wonder, seeing in him a great gentleness and concern for others and desiring to know him more and more. Once again, they began regularly running into each other at the Newman Center, service events, and pro-life work. He got involved in the prolife club again, and we ran into each other at service events and Newman Center social events regularly. At the Catholic sorority fall formal, David looked at Jackie across the dance floor after talking casually throughout the evening, and it all came together in his mind. They danced, and he asked her out a few days later. Months after, David took Jackie on another road trip to Cathedral Rock; this time, to propose. From the Bride: Saint Patrick is David’s confirmation saint, and his feast, Saint Patrick’s Day, is exactly halfway between our birth dates. It was also the only Saturday available in March, one of Arizona’s most beautiful months. My only stipulation about a Saint Patrick’s Day wedding was that the theme not extend to any of our aesthetic and décor. David easily agreed. 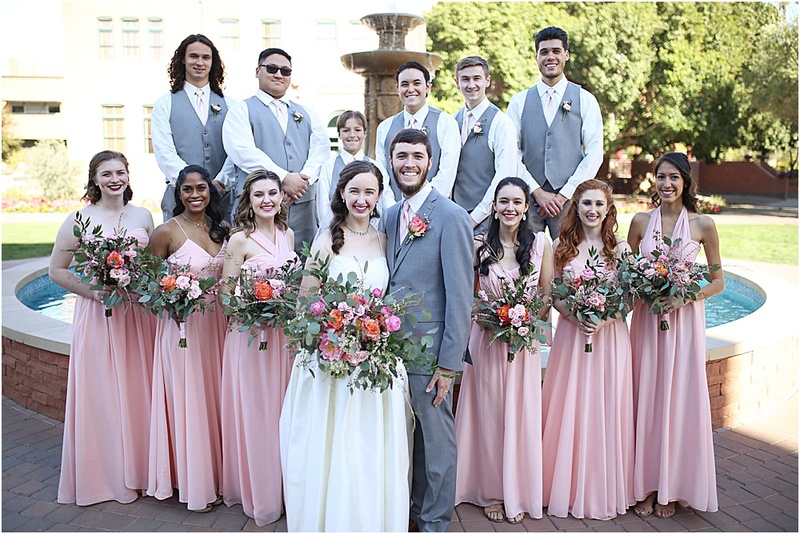 We chose a springtime desert theme: soft pinks and greens, with a pop of mango in the bouquets. I fell in love with the desert’s unique beauty when I moved to attend ASU, so I wanted to surround ourselves with it and delight all of our out-of-state guests. 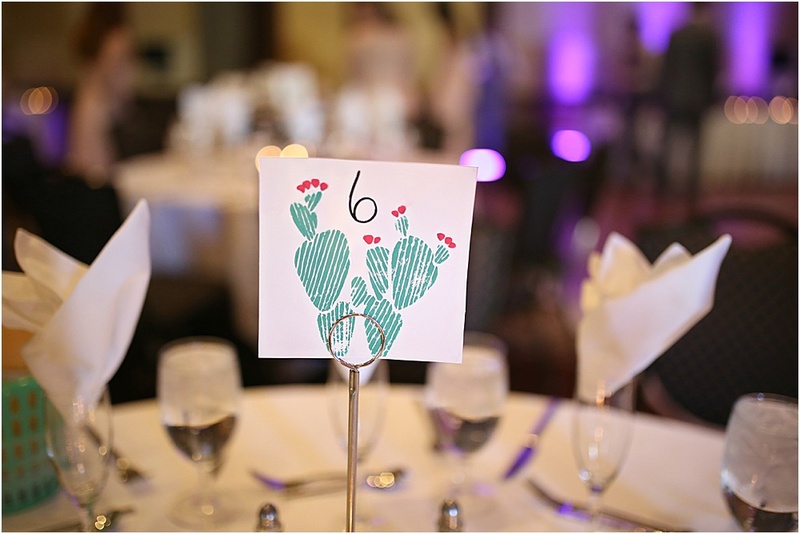 There were cacti illustrations on our invitations and table numbers, and I bought nopales to create hand-lettered signs--I practice hand-lettering because I think it’s whimsical, romantic, and deeply personal. Our wedding program was actually inspired by Christina Dehan Jaloway’s. My favorite element was including the reasons David and I chose each of our Mass readings. I really hoped to counter the idea that Catholic weddings aren’t as personalized or meaningful as secular ones with custom vows and varied locations. For David and me, a Catholic wedding in this place, on this day, with these readings and traditions, was the most intensely personal and meaningful ceremony we could dream of. We were married in the intimate Newman center where we had met and grown throughout college. I was overjoyed to share this church with my friends who had never seen it. David really experiences the Mass through traditional music, so we hired his home parish’s choir to sing. Their arrangements were so heavenly I was brought to tears. I was afraid I’d be self-conscious during the ceremony, but I felt so grounded. I was filled with the deepest peace, gratitude, and radiant joy. I knew God was there, waiting for me, excited to bond me forever to my husband and lavish his grace upon us. I felt completely alive and able to take in every passing, precious moment. We smiled and looked at each other during nearly the entire ceremony. We involved friends and family as vendors because we knew they could do great work. Our readers, gift bearers, and altar servers were all friends from Newman; our college friends also did our photography, table numbers, and my hair. David’s mother, a talented baker, made our wedding cakes, and his family made all the food and decorations for the rehearsal dinner. David and I danced our first dance to “Amazed” by Lonestar. We surprised our guests with a choreographed dance that built from slow dancing to nightclub two-stepping, to Arizona two-stepping, to country swing. It was a joy to showcase the love of dance we developed in college! We also chose to do a garter throw, but with a twist. Pulling up my dress in front of family was a little beyond our comfort level. Thankfully, David has a goofy sense of humor! We opted to have him seductively approach me, only for me to sit him down in my seat, and then pull up his pant leg to reveal the garter on his ankle! It worked for us, and it was hilarious when David’s 10-year-old brother caught the garter, hoisted in the air by one of David’s friends. Besides getting sacramentally married to the love of my life, the most meaningful part of the nigh twas the presence of my out-of-town family. 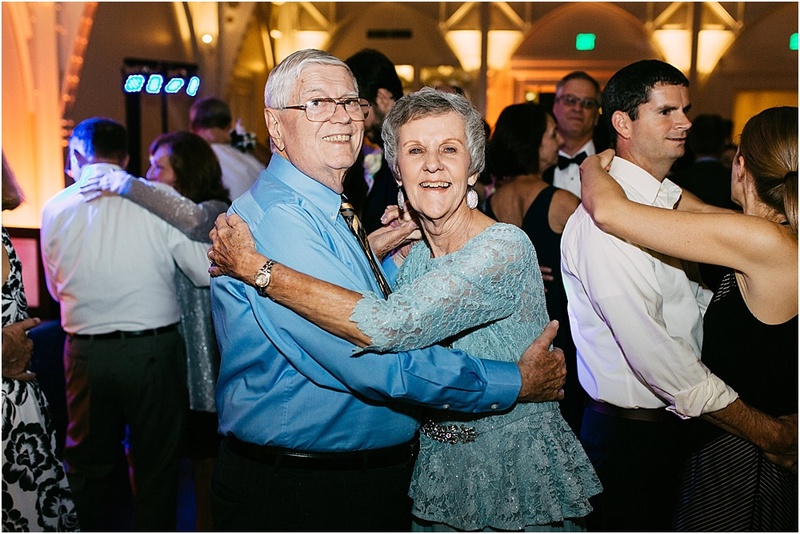 All of my dad’s six siblings, their spouses, some cousins, and my grandmother flew out for the big day--she is 96 years old and stayed near the dance floor until the DJ closed it down at 11 PM! My family had never hosted all of our relatives at once—we were usually the ones flying back East to visit them and dance at their weddings. They welcomed David with such open arms. Some of my fondest memories are seeing David arm-in-arm with my cousins in a huddle, talking enthusiastically with my aunts and uncles, and impressing them all with his dance moves. The evening ended with all the remaining guests circling up around us, arm-in-arm, singing “Friends in Low Places” by Garth Brooks. The last chorus, we were all in one massive group hug. It’s truly a night I will never forget. Being surrounded by the ecstatic joy and presence of my husband, family members and friends, was the most vivid experience of heaven I’ve ever had. People have often remarked on the sense of peace I carry with me. Throughout wedding planning, often vendors noticed how at ease I seemed during our meetings, saying many couples were already stressed by the first meeting! However, don’t get me wrong—this peace was tested and hard-earned. There were experiences of fearing we would never find a venue, fearing we would lose our venue, having vendors back out, and stepping on boundaries as we merged family traditions and expectations. 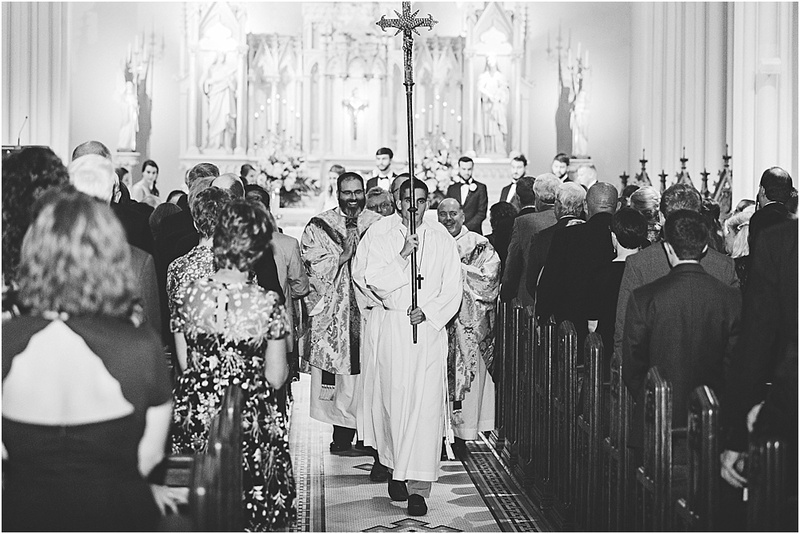 This process drew me deeper into God’s involvement in a Catholic wedding day. Joy: My friends and family are looking to see that I’m happy, not that everything’s perfect. Seeing a happy bride is what really is beautiful and gives joy to others’ hearts. Peace: God the Father is in control of the day. He led me to my husband, and he has called us to receive the sacrament of marriage. He will be there on the big day. It’s his show! He is the one providing the grace uniting us together for life. He is the one who will provide, not me. Surrender: “Mistakes” will inevitably happen. In those moments, I wanted to go with the flow. I wanted to receive the day as God was delivering it, pondering everything in my heart like Mary did at Jesus’ birth. I wanted to laugh lightheartedly about whatever happened and see it as a good story to tell later. The human experience of the event was all in the emotions felt, not the visual details or the perfect timeline. Collecting and pondering these quotes stabilized me. It helped me internalize these truths and prepare spiritually and practically. 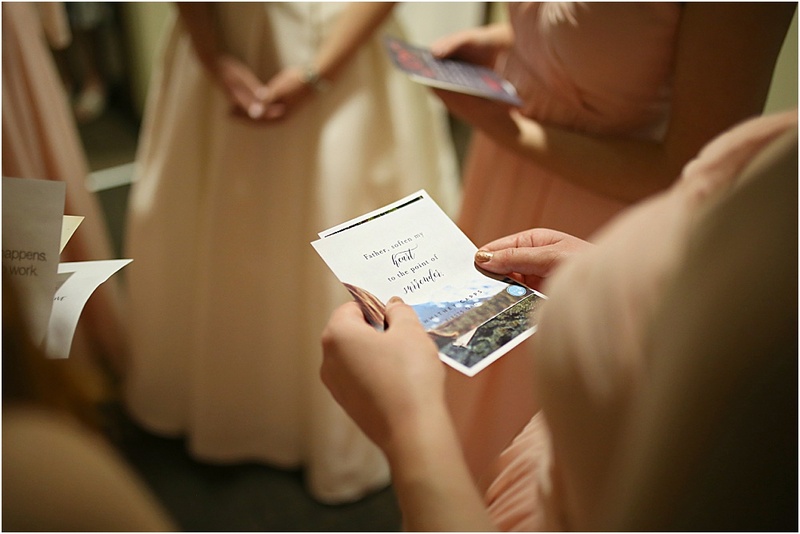 On my wedding day, my bridesmaid printed some of the quotes from my board and distributed them. We gathered in quiet place before the ceremony. I led us in prayer and each girl read three of my handpicked quotes to center us, reminding us what was most important on this day. I can't tell you how relieved I felt to hear my dear friends speaking those words back to me. As I waited alone to join the procession, I felt as grounded as the strongest and tallest tree in the forest. My heart overflowed in thanksgiving to God for bringing me to this day. I remembered I was the receiver of this day, and God was the giver. There is this pressure to provide “magic” as the bride and groom; the event planners. That’s why the details can be so stressful. You may feel like if a detail is imperfect, it will ruin the illusion of heaven you are trying to create for yourselves and the guests. The details are meant to elicit joy… but it really helped me to remember that they are not the true source of the joy. Ultimately, the union of two people together, to be married for life, can only be done by one being, the Almighty God. A celebration of what He has done in the lives of these two people. I found a quote that said, “A wedding is a celebration that God loves his people.” And at our wedding, there was a real sense of supernatural joy. 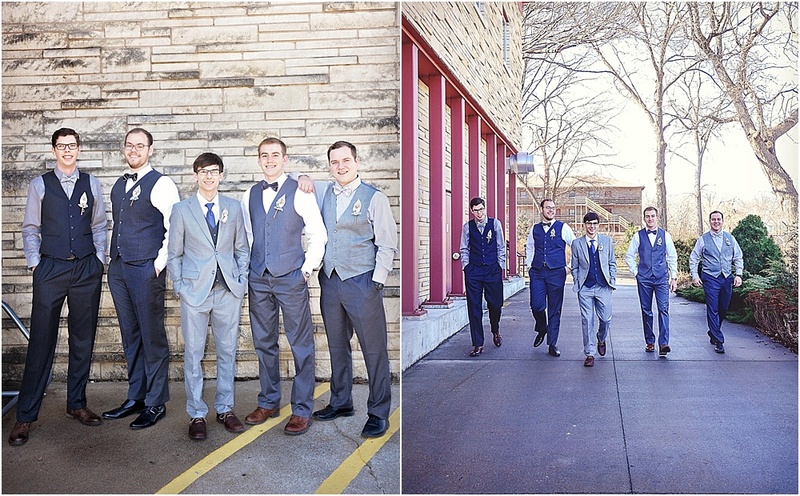 It pervaded everything, from the ceremony to the photo-taking to the reception. That, I could not have planned or pinned. Only God could provide that. 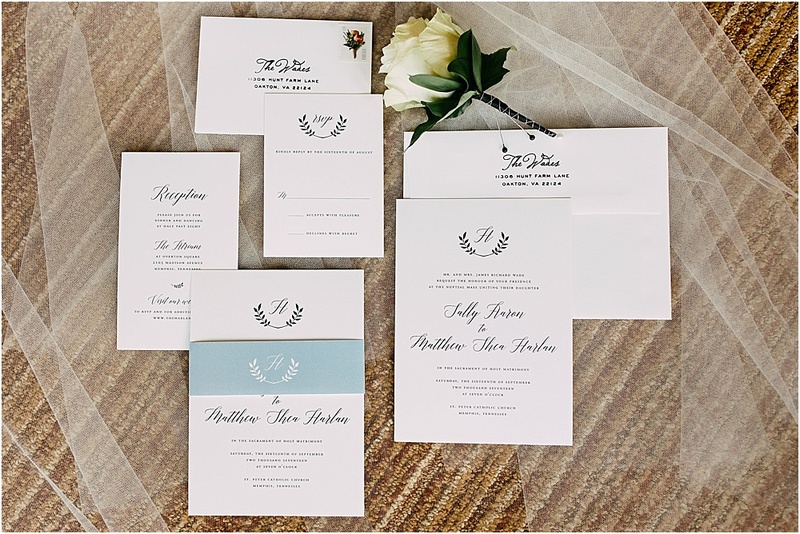 Are you recently engaged and just beginning to identify your wedding aesthetic? Did you know Spoken Bride weddings are indexed by color, style, and state? Click the tags at the bottom of each wedding feature to see similar celebrations. 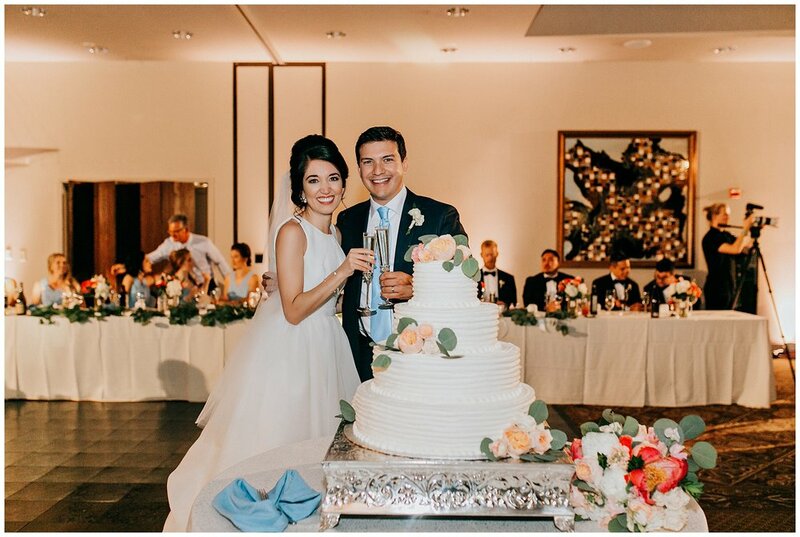 It’s our honor to be invited into the unique, singular beauty of each of our couples’ special days and to share the distinctively Catholic elements that elevate their wedding days and point their guests’ senses heavenward. Here, a collection of our past features. For our new brides, we hope they help you find your own style and introduce you to some of our incredible couples whom you might not have encountered before. For longtime readers, enjoy this look through the archives! Wherever you’re coming from we desire above all that like us, you’ll take in these stories and step back with nothing but awe, reverence, and gratitude for the Father’s fathomless love for his children. Feeling a call to share your proposal or wedding day with our community? Submission info can be found here. Starting on her 13th birthday, Chloe prayed daily for a man in love with the Church, who would lead her closer to Christ. Little did she know her future husband was growing up nearby, in the very same town. Looking back, she and Joseph suspect their paths likely crossed in their early lives. Their story didn’t begin, however, until the summer before college, when Joseph participated in the mission trip Chloe was serving as a staff member. Throughout that week spent painting houses in a rural town, each found humor and honesty in the other, discussing everything from religion to places they dreamed of traveling. Joseph returned home after the mission and found Chloe and her blog on social media. He later contacted her letting her know he’d read much of her writing, pursued a friendship, asked Chloe out on a date the night of her birthday. Their college years were spent long-distance, with many weekend dates spent at Mass and in Adoration. Chloe loved the way Joseph strove to make Christ the center of their relationship from their first date onward. They chose Pope Saint John Paul II as the patron their relationship, praying for his intercession at the end of every date and phone call. Their call to marriage became clear. On New Year’s Day, Joseph shared that he’d love to ask Chloe to marry him before the end of the summer. She valued his leadership and intentionality, waiting eagerly for the next step in their relationship. By spring break, after seeking Chloe’s dad’s blessing and on the final day of a backpacking retreat in Big Bend National Park, Joseph invited Chloe to climb the highest point in the park, Emory Peak. As the sun rose, he got down on one knee and asked Chloe to climb life’s peaks and valleys beside him as his wife. From the Bride: Despite everyone’s warnings of wedding week stress, our wedding day was one of the most joyful, stress-free days of my life. Every moment was filled with blessings--as if God was smiling down, opening my eyes to beauty and whispering, this is for you. Joseph and I wanted to spend as much of our wedding day together as possible, so we began the day by attending morning Mass and having breakfast together. Before we parted ways to get dressed for the ceremony, we visited Christ in Eucharistic Adoration for our last holy hour as an engaged couple. Before meeting up with our wedding party, I surprised Joseph with a Papal Blessing, a gift I planned with the generous help of our seminarian friends in Rome. It now hangs in our bedroom as a daily reminder of our sacrament. I decided to do my own makeup for the ceremony, and I wore the same makeup I wear on an everyday basis. I had thought about makeup quite a bit, but it was only when I thought back on our relationship that the answer to my inner debates became clear. When I met Joseph, I wasn't wearing any makeup. I had on a baggy t-shirt, and sports shorts. I spent the first week we knew each other on mission covered in sweat, pancake batter, and paint chips. Joseph proposed on top of a mountain. When he asked me to be his bride, I hadn't showered in six days, my hair was greasy and stuffed under a baseball cap, and my eyes were bleary from waking up at 5:00 AM. And he thought I was beautiful. I don't wear much makeup on a daily basis, but it seems Joseph compliments me most on the days I wear it the least, or not at all. So when I saw Joseph on our wedding day, I wanted to look like the girl he scraped paint with two summers before. I wanted to look like the blissfully happy girl who said yes to climbing life's highs and lows alongside my husband (although I did shower for the wedding!) . We desired to make prayer part of our preparation for that day. My bridesmaids and I spent time praying and singing together. Meanwhile, Joseph and the groomsmen prayed a rosary in the side chapel. Then it was time to walk down the aisle. Traditionally, the last people to process into a Catholic Mass are the officiants of the sacrament. During a wedding, the bride and groom are the ministers of the sacrament to each other, with the priest and wedding party witnessing their vows. We decided to adopt this practice for our entrance. A unique touch was the way Joseph and I sat during the ceremony. We didn’t want to have our backs facing our guests, so we placed our chairs to the side of the sanctuary instead of using kneelers that faced the altar. We were blessed to have our wedding Mass concelebrated by six of our close priest friends. The main celebrant was a priest from the parish we spent the most time at during our relationship. We chose readings were from Tobit, Ephesians, and the wedding at Cana. In the days before the wedding, Joseph and I prepared to consecrate ourselves to Mary, using Fr. Brian McMaster’s book Totus Tuus: A Consecration to Jesus through Mary with Saint John Paul II. Every night, regardless of how busy we got with planning, we took time to pray the rosary and reflect on the importance of Mary in our relationship. At a friend’s wedding we’d attended together, we were entertained the whole night by a very enthusiastic maraca player in the band. Joseph surprised me with a pair of maracas on the drive to the reception–-a car dance party ensued! Joseph and I decided to look at the reception as a big dinner party. Our wedding week was spent cooking soup, creating a salad bar, and gathering bread. We loved cooking together when we were dating, so preparing food for our reception was a beautiful way spend time together and anticipate the big day. 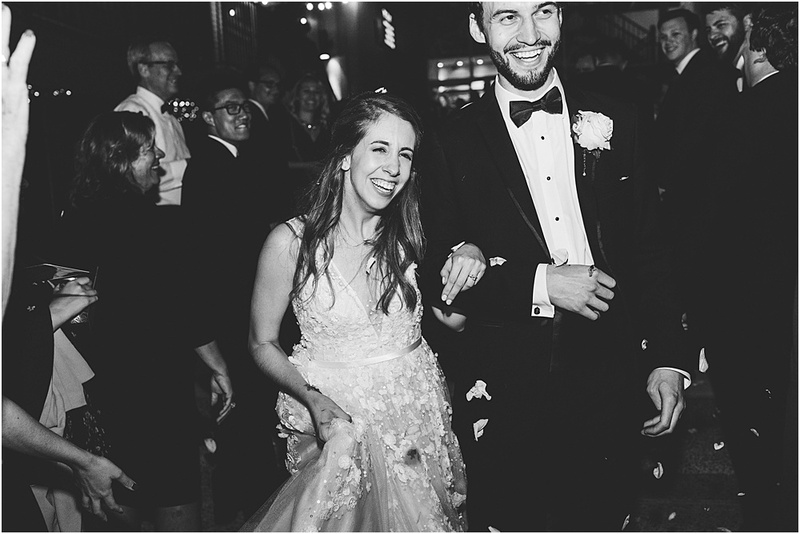 Our first dance was to Ben Rector’s “Forever Like That.” We loved spending time with friends and family on the dance floor, but we also walked around to catch up with our other guests, as well. There way too many love songs, and I think they've got it all wrong. 'Cause life is not the mountain tops; it's the walking in between. And I like you walking next to me. My prayers, first whispered at thirteen and now proclaimed in front of all my friends and family at our wedding, had been answered. God had introduced a man into my life, and now we were striving to sainthood together. Our wedding day was joyous because we had spent so much time preparing our hearts together. Joseph and I prayed nightly, heads bowed close, begging God to strengthen us and to help us give ourselves freely, totally, faithfully, and fruitfully to each other. We made sure to spend just as much time preparing for our marriage as we did our wedding. Although it seemed crazy to those around us, we took off a night from wedding planning during our wedding week. We threw on our hiking shoes, went on a walk, and got coffee. We didn’t talk about the wedding at all. Instead, we spent time laughing, praying, and reminiscing on how God had worked in our relationship. Now we advise each engaged couple we know to spend time on a wedding week date. It was one of the best things we could have done for our relationship during that week of preparation! Read more here for the story of Sally and Matt’s courtship and engagement, marked by total joy, certainty, and peace. When Sally’s friend told her she knew a man who was tall, handsome, and serious about his Catholic faith, she jokingly suggested Sally marry him. Sally was intrigued, yet hesitant; her job required a significant time commitment, and Matt had just begun medical school. At the time, he had made a decision not to date until he was done with his studies. The Lord has a way of changing our plans for the better. When they met, spending time together among their local Young Adult ministry, the attraction was mutual. Despite the other obligations in their lives, Sally had the boldness to ask Matt out! A sense of trust and certainty about their call to marriage was clear from the beginning, and Matt proposed, with Sally’s grandmother’s ring, the following year. From the Bride: I was talking with a few girlfriends recently about how important, but also difficult, the season of engagement tends to be. At least in my experience, it was difficult to balance planning a wedding with preparing for marriage. Matt and I had such a desire to be together--to be fully united as husband and wife, to live in the same house, to make all our decisions together--but the reality was that we weren't there yet. We were also learning how to build our relationship with each other and Christ, alongside the very real and often overwhelming responsibility of planning a wedding. In all of it, we received great advice from another young couple and from dear priest friend that helped us tremendously during our year-long engagement: first, focus on planning the Mass. When we felt overwhelmed by cake flavor choices or dress colors, we remembered to keep our focus on the sacrament of marriage itself. Second, a priest told us to be at peace, because ultimately, it was Jesus who would be there on the altar with us on our wedding day. How could we be afraid, nervous, or overwhelmed knowing that the Lord of the universe loved us so much that he would be there to unite as husband and wife, and to accompany us in our married life? The day before our wedding, Matt and I went to confession and then Mass, just the two of us, before a flurry of family and friends arrived. I remember walking out of Mass hand in hand with a sense of peace just washing over me. We had spent the last two years falling deeper in love with each other and with Christ. We had grown in patience and trust, practiced chastity even when it was difficult, learned to pray as a couple, and finally our wedding had arrived. From that moment on, the weekend was filled with joy. We decided to take pictures before the Mass because we wanted to spend as much time as possible at the reception with our friends and family. 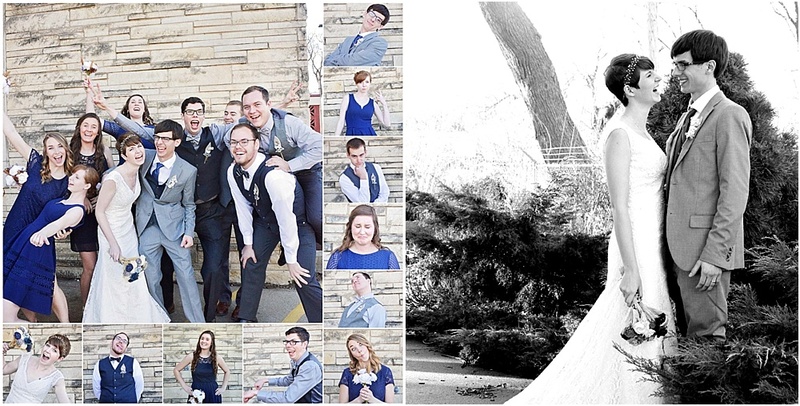 We took pictures at a nearby park, first just the two of us, and then the bridal party joined for group pictures. 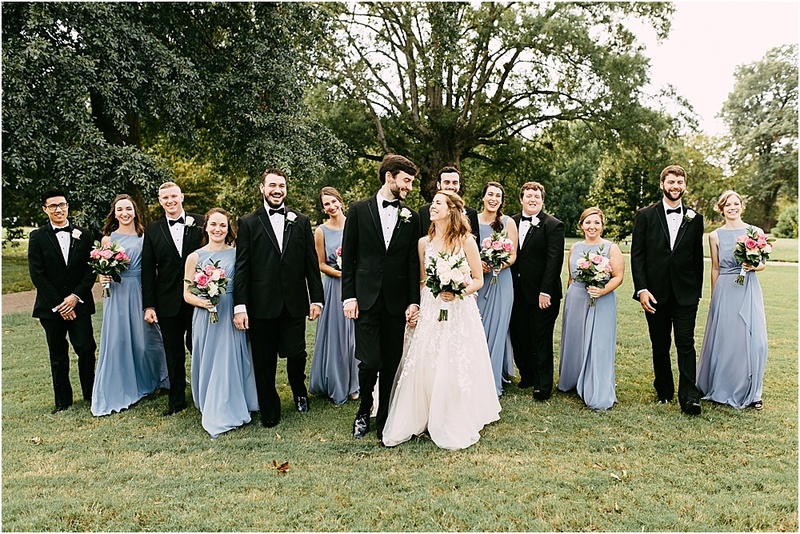 I was a little apprehensive that seeing each other before the wedding would somehow ruin the big reveal as I walked down the aisle, but it ended up being the only real opportunity Matt and I had all day to just take a deep breath and be together. 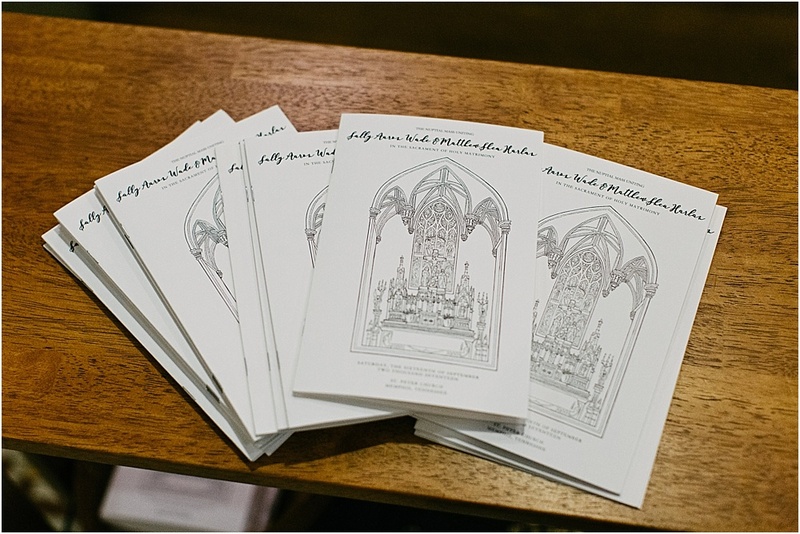 We spent a lot of time thinking through the details of our Nuptial liturgy. We were blessed to have four priests concelebrate; all of them, along with the bridal party, processed in behind the raised Cross to the hymn "O God Beyond All Praising." An unexpected benefit of choosing hymns instead of more traditional instrumental pieces for the procession is that every time one of these hymns is played at a regular Sunday Mass, it brings back all the great memories from our wedding day. We provided wedding programs since not everyone who attended was Catholic. By including the music and major Mass parts in the program, we hoped people would feel more comfortable participating in the liturgy. One of my bridesmaids and dear friends designed the front of the program. She did an ink drawing of the altar from our home parish, where the ceremony took place. She had the original print framed, and it now hangs in our home as a beautiful reminder of our wedding day. We chose Matthew 22:35-40 for our Gospel reading, in which Jesus teaches that the greatest commandment is to love God with all your heart, soul, and mind. That really is what this whole Christian life is about. In marriage, God has given us the immense responsibility to help get our spouse and children to heaven, and we do this by learning to love God more perfectly. After communion, we approached Mary and asked for her intercession in our marriage. While we spent a quiet moment at the foot of her altar, our family and friends sang the Salve Regina. My favorite part of the whole Mass was getting to say our vows and slipping a ring over my husband's finger. I thought I would be nervous in that moment, but the Holy Spirit was so present to us. I'll never forget looking into Matt's eyes and being overwhelmed with gratitude for what God had done for us. The reception passed by in a flash. We were lucky enough to have a wedding coordinator who snuck us into a back room of the venue for a bite to eat before we made our entrance on the dance floor. I can't recommend this enough to friends who are engaged! Once we entered the reception, every moment was spent either dancing or hugging all of our dear friends and family who had traveled to be with us. We wouldn't have eaten anything if it weren't for those first 15 minutes in the back! We knew that we wanted to have a fun, family-friendly reception. We decided to forego the bouquet toss, but did a traditional first dance as well as Father/Daughter and Mother/Son dances. We had a simple wedding cake from a local bakery we both love, and also offered two other passed desserts. "Tonight, I promised you, Sally, that I would spend every day of the rest of my life loving you and serving you. 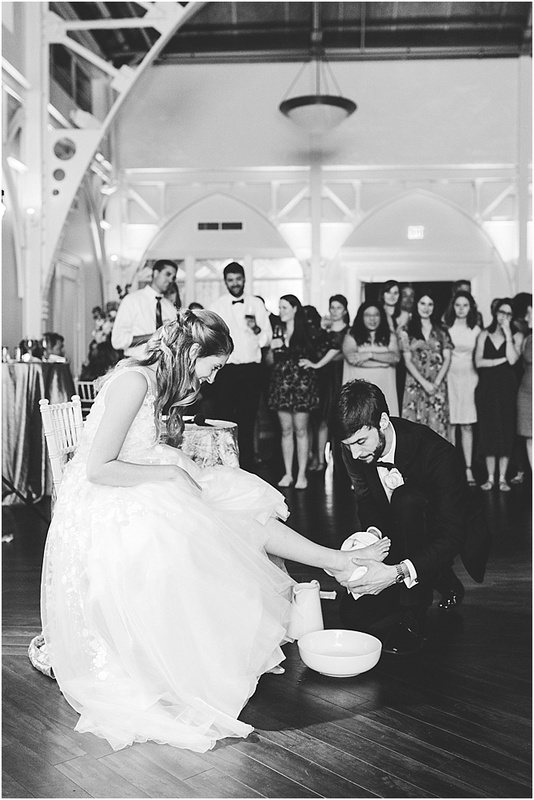 So as my first act of service to you as my wife, I would like to wash your feet." The moment was brief, but so sincere and I think speaks volumes about the kind of man my husband desires to be. As reception favors, we gave out 4x6 watercolor prints by the talented Katrina Harrington of Rose Harrington Art that read, "The human heart is always drawn by love." We hoped this quote by Saint Catherine of Siena would be a small reminder to our guests of how much we love them. We also had a lot of fun planning the smaller details of our day. My engagement ring was originally my grandmother's ring, which she generously gave to Matt before he proposed. His wedding band was his grandfather's; I had it engraved on the inside with totus tuus, meaning “totally yours.” This phrase was Saint John Paul II's apostolic motto and referred to his total devotion to the Blessed Mother Mary. To us, the phrase reminds us to entrust ourselves fully to Mary and, ultimately, to Jesus--but also completely to one another. Marriage is such a precious gift from God because it reveals--albeit inadequately--the mystery of God's love. I marvel at the fact that in marriage, God invites me to love as he loves. In our vows we promised "to be faithful to you in good times and in bad, in sickness and in health, to love you and to honor you all the days of my life." It is our job to try to live that out each day since. We love imperfectly because we're human, but the experience of Matt loving me completely and unconditionally is truly the biggest gift I have ever received. I cannot begin to comprehend how much more God must love me. Instead, I try to simply give thanks to God daily for his abundant blessings and to serve him unconditionally.